White House press secretary Sarah Sanders was expelled from a restaurant Friday night (20/6/2018) for working for President Donald Trump. The owner of the Red Hen restaurant in Lexington, Virginia, asked Sarah Sanders and his family to leave the restaurant in protest against the Trump administration. The Red Hen owner, Stephanie Wilkinson, said she believes Sanders is working for an "inhuman and unethical government," the BBC reported. He told the Washington Post that he had decided to ask Sanders and his family to leave after talking to his staff. "Tell me what you want me to do. I can ask him to leave, "Wilkinson told his workers. "They say yes." The incident comes a few days after Interior Minister Kirsten Nielsen was derided while at a Mexican restaurant in Washington DC. Nielsen is shouted by a number of people who call it a shame he enjoys a meal at a Mexican restaurant while his government is acting very hard on migrants and separating children-including boys-from their mothers and fathers. As President Trump has also insisted on building a wall along the border with Mexico that he accused of being the entrance of illegal immigrants, murderers, robbers, bastards and drug traffickers to the United States. The actions of Red Hen's restaurant owners to evict Sarah Sanders from his restaurant were criticized by some as discriminatory and fanatical. However, not a few people who praise him. "I love this place. Very moral and the food must be delicious ..., "wrote an internet user as quoted by the BBC. Wilkinson said he asked Sanders to talk to him outside before explaining that his restaurant has some standards to uphold, such as honesty, compassion and cooperation. He said that Sander immediately responded by saying, "That's fine. I will go." Following the incident, on Twitter Sanders writes that "his actions (Wilkinson) show more about him than I do." Earlier in late April, Sanders became comedian Michelle Wolf jokes at a dinner party with media crews who were correspondents at the White House. Spoken with language and figurative speeches, Wolf repeatedly calls Sarah Sanders's work-the daughter of former Arkansas governor Mike Huckabee-is lying for the sake of President Donald Trump. 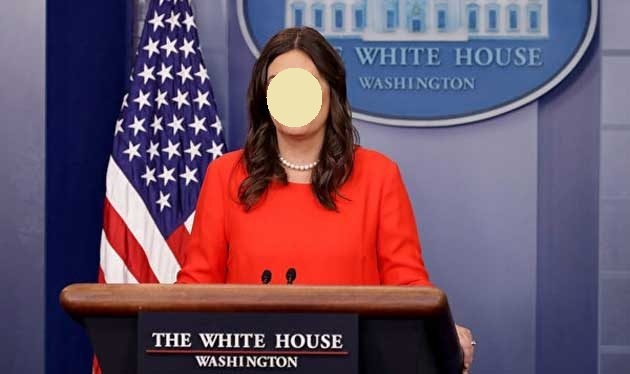 0 Response to "White House Press Secretary Sarah Sanders Expelled from Red Hen Lexington Restaurant"